DIY Essential Oil Bug Spray - It Smells Good AND Works Too! Being able to enjoy the outdoors without worrying about bugs and insects is something we all deserve. One bite can spoil a great day, and make it downright uncomfortable. Preventing bites or stings in the first place is the best defense so you need a bug spray that works. The problem is many bug sprays are full of chemicals that not only kill the bugs, but are toxic too. When applied, the toxins are absorbed through the skin so even small amounts are not ideal. An essential oil bug spray is the perfect non-toxic option. With the right oils, it will work to keep the bugs off while being much safer. My favorite bug spray recipe combines three essential oils – lemongrass, lavender and eucalyptus. Not only is it non-toxic, it smells good too. 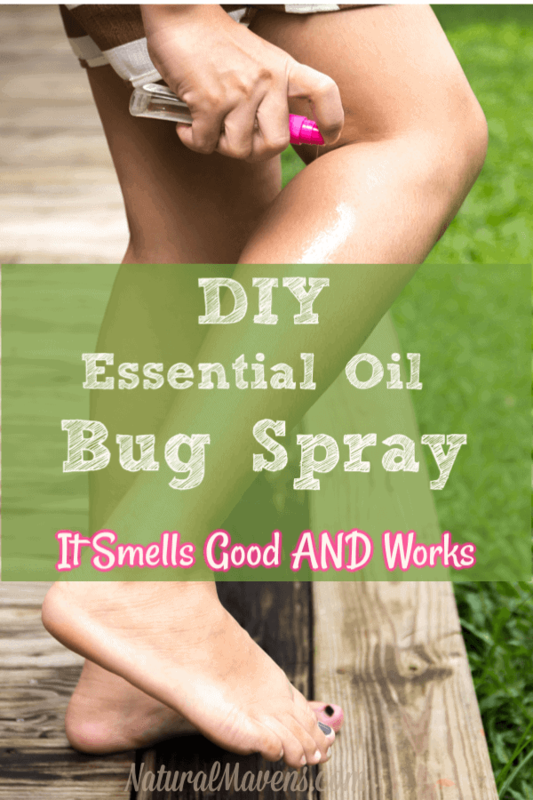 This bug spray recipe uses lemongrass, a natural reliever and circulatory stimulant. The oil also has a distinctive clarifying aroma that heightens consciousness. Lemongrass is a superb bug repellent that keeps most bugs at bay. This includes mosquitos, ticks and fleas. Added to the mix are lavender and eucalyptus oils, which makes it even more powerful. Using the spray before venturing outdoors will ensure a happier, less irritating experience. Add all the ingredients into a 4 ounce glass spray bottle (like these). Put the lid on and shake well. Use as needed before going outside. Spray all areas of exposed skin. Shake well before each use. To make a larger bottle, simply multiply the amounts as needed. You can also make a rub on lotion by adding the essential oils to a carrier oil. Jojoba or fractionated coconut oil would be suitable. NOTE: You can also keep the bugs away by diffusing essential oils. Choose from any of the oils listed above or try the ‘Bug Off’ essential oil blend. Make up a batch (or two) of essential oil bug spray and keep a bottle handy for whenever you go outdoors. Keep those insects away and enjoy your day! NextRosehip Oil for Anti Aging…Is It Really That Good? Could you use plastic bottles for this.